huck McConnell speaks on behalf of Rep. Scott Tipton (R) at a forum. In a hotel ballroom, at the base of the Steamboat Ski Resort, candidates for the US House and Senate, and their surrogates, tick through talking points. “There are two issues I know of Scott Tipton cares very, very deeply about. One of them is water. The other one is energy,” Chuck McConnell, of the Routt County Republicans, said. 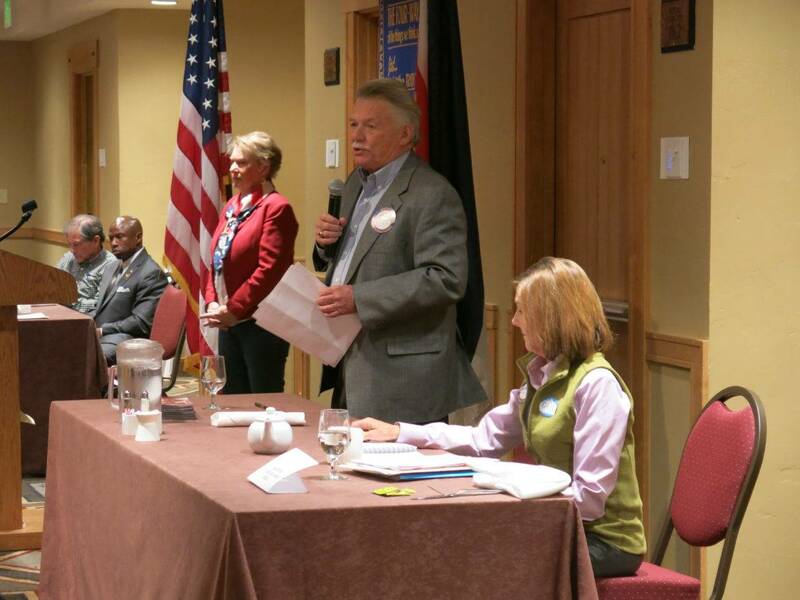 McConnell stood in for Congressman Scott Tipton at a candidate forum hosted by the Rotary Club of Steamboat Springs. Tipton is a third-term Republican incumbent who is running for reelection in Colorado’s 3rd congressional district. The crowd at the forum was made up of bankers, property managers and many small business owners. Steve Hitchcock, the Rotary Club President, told me that he wasn’t aware of any members working directly in the coal industry. But coal came up again and again. “The coal industry is under incredible pressure here. Twentymile coal mine has decreased the number of employees that they have. Keeping responsible, reasonable energy production and coal, which can last this country for another 200 years, those are two issues, water and energy that are very much on Congressman Tipton’s mind,” McConnell said. This rural congressional district spans almost half of the state, but is home to only 14 percent of Colorado’s total population. It includes resort communities like Aspen, and Steamboat as well as all of Colorado’s active coal mines. Production is way down and at least 700 coal miners have lost their jobs over the past few years. The district’s economic shift away from coal has been a major campaign theme. campaign video he accused his challenger of waging a war on coal when, as a Colorado State Senator, she sponsored legislation to up Colorado’s renewable energy standard for rural electric cooperatives. “Once elected, she sponsored SB-252, bill to reduce coal-generated energy for rural Colorado. Gail’s actions in the legislature devastated the coal producing communities she was elected to represent,” according to the video. Gail Schwartz disagrees with this characterization. “I’m not anti-coal. The real victims in this finger pointing and blaming are these communities. They’re the true victims,” Schwartz said at a campaign event in Steamboat, following the candidate forum. Schwartz says Tipton has done little to prepare communities for a post-coal economy and that she wants to invest in jobs in outdoor recreation and renewables, like the Vestas wind tower manufacturing facility in Pueblo that employs hundreds of people. “I’m trying to help support those communities. This is tough and this is a tradition and this is a culture. So I totally appreciate it. What folks here can also recognize is that we will have opportunities around hydro, and geothermal, and biomass, and wind, and solar, and those jobs and opportunities and retooling that workforce, there is a path forward,” Schwartz said. The campaign focus on coal is about more than actual jobs and income. “This is a mining state. That’s why people came here to begin with. So the economic opportunity that that provided, that’s why we exist as a state,” Dustin Olson, a Denver-based political consultant, explained. As of data filed on October 15th, Rep. Tipton has received around $200,000 more in campaign contributions but Schwartz has gotten more from individual donors. With just weeks to go before election day, the candidates are practically neck and neck in campaign cash. New data from the Federal Election Commission, shows that Schwartz has collected $1.3 million to Tipton’s $1.5 million. Big coal companies have contributed very little to this race. With less than one month to go before election day, Arch Coal has given $5,000, and Peabody Energy has given $2,000, both to Tipton. “So in a volatile election, districts like that are the ones that are more likely to do something different. Those districts can swing wildly,” Olson said. Sometimes the tradition that Gail Schwarz and Dustin Olson talked about has a strong pull. Take the tiny town of Oak Creek, just 20 miles south of Steamboat. Today, the town is home to a gastropub and a marijuana shop but a gigantic coal shovel sits on the main drag, as a monument to Oak Creek’s coal mining history. I met Bill Babcock at the post office. He is a mailman who plans to vote for Scott Tipton. He wants a Republican to represent him, in part, because Babcock thinks President Obama is killing the coal industry. “The mining industry has been one of the lifelines of this community, Without it, it will be devastating,” Babcock said. The people of Oak Creek do have reason to worry. Its schools rely heavily on revenue from the industry. When bankrupt coal giant Peabody Energy failed to make a tax payment in June its school district had to dip into the state’s emergency fund to pay its bills. A conservative group called the Congressional Leadership Fund is hoping to reach more voters like Bill Babcock. The super PAC is spending $1.3 million on pro-Tipton TV ads, starting this week. Check out Coal Watch 2016 for comprehensive coverage of the downturn in coal. For more on the Oak Creek school funding situation, Ann Marie Awad visitedthe local preschool. The candidates are nearly matched in campaign contributions. But where is the money coming from? Inside Energy is digging into the data. Stay tuned!